Dalwhinnie 15 Year Old Highland Malt Whisky is a popular Whisky available from Waitrose Cellar in 70cl to buy online. Visit Waitrose Cellar for the best price for 70cl of Dalwhinnie 15 Year Old Highland Malt Whisky or compare prices on our other Whisky products. Fifteen years of gentle maturing make this a smooth malt without a trace of harshness. Lasting impressions of heather, honeyed temperedness and vanilla followed by deeper citrus fruit tastes and clues of malted bread combine welcomingly in this gentle spirit that is full of character. Where to buy Dalwhinnie 15 Year Old Highland Malt Whisky ? Dalwhinnie 15 Year Old Highland Malt Whisky Supermarkets & Stockists. 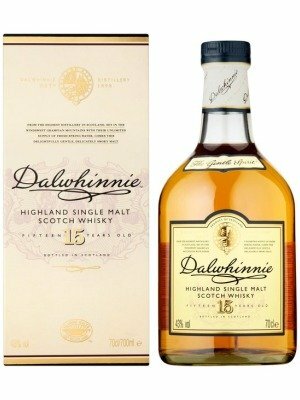 You can buy Dalwhinnie 15 Year Old Highland Malt Whisky online in most retailers and find it in the Whisky aisle in supermarkets but we found the best deals online for Dalwhinnie 15 Year Old Highland Malt Whisky in Waitrose Cellar, DrinkSupermarket.com, TheDrinkShop, and others. Compare the current price of Dalwhinnie 15 Year Old Highland Malt Whisky in 70cl size in the table of offers below. Simply click on the button to order Dalwhinnie 15 Year Old Highland Malt Whisky online now.